Once you have an easy monkey bread recipe, you can play around with the ingredients to create scrumptious variations. Everyone loves the classic monkey bread, but with simple additions the flavor possibilities are endless. 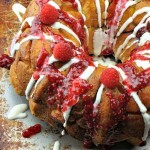 I think this white chocolate raspberry monkey bread would look beautiful on an Easter brunch table. If you are looking for an easy, but impressive baked treat to serve, well anytime, I recommend giving this monkey bread recipe a try. Boil the raspberries and sugar together until they start to thicken. Allow to cool and thicken some more before removing from heat. Set aside until it’s time to drizzle on top of monkey bread. Melt white chocolate chips and coconut butter together. Preheat oven to 350 degrees and spray bundt pan with cooking spray, coat with flour. Melt butter in a bowl. Dip each biscuit piece (from 1 can of biscuits) into the butter, then place into the bundt pan. 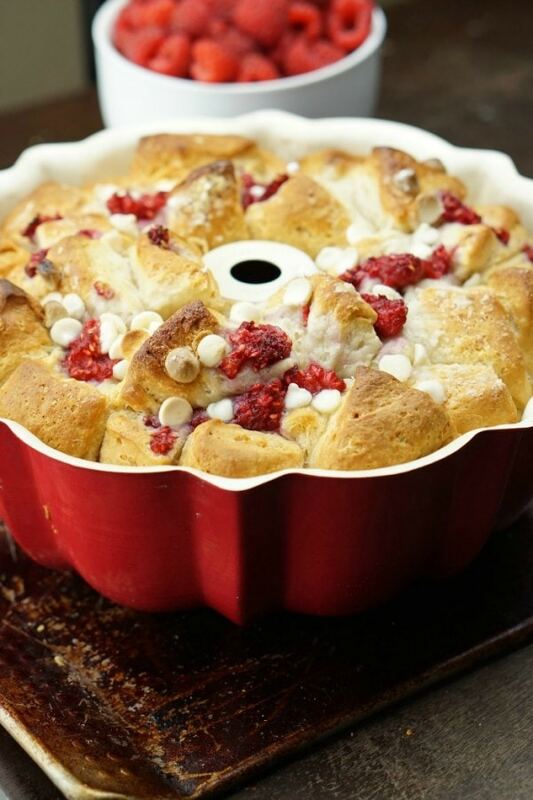 Top the biscuits with ½ of the raspberries, and ½ of the white chocolate chips. Repeat for the rest of the biscuits, white chocolate chips, and raspberries – leaving some for topping at the end. Bake for about 35 minutes. Edges will be dark brown, and center will be lighter. 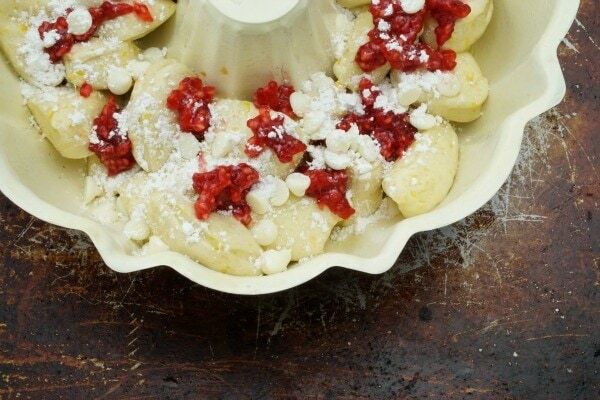 Top with raspberry jam, white chocolate drizzle, powdered sugar, and extra berries. Here is a monkey bread recipe all dressed up. 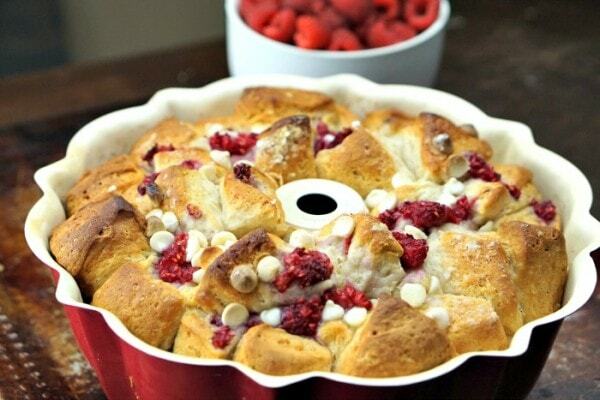 White chocolate raspberry monkey bread is great to serve at brunch or holiday gatherings. Have you ever added ingredients to tweak an easy monkey bread recipe? This sound really good, but will have to use strawberries instead of raspberries. If you add chocolate and berries to any bread I shall love it! I might use cherries or strawberries and dark chocolate for variations. A gonna have to make soon – thanks. I have never had or made monkey bread. This does sound delicious and looks wonderful also! 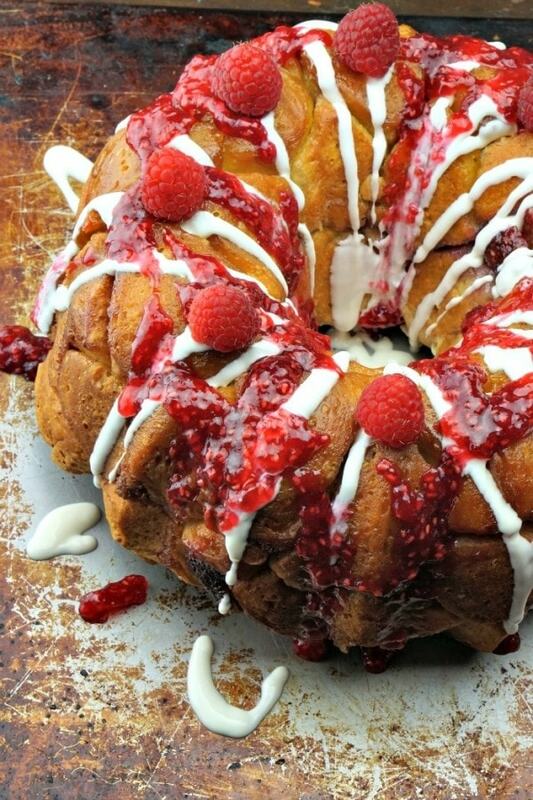 We love monkey bread and this recipe sounds delicious! Raspberry and white chocolate just look so elegant together! This really looks good and is something my whole family will love. I can’t wait to give it a try. I’ve never made monkey bread only eaten what others have made. I like your additions and it looks beautiful. 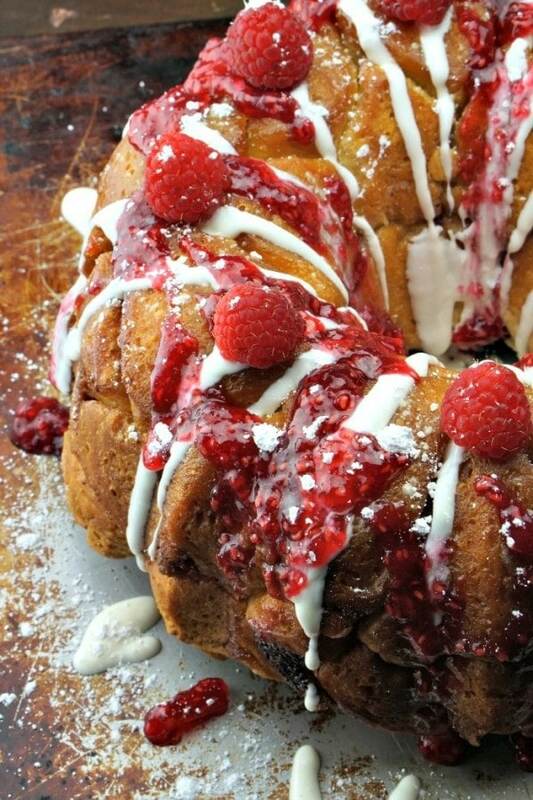 Love to bake and I will be making this Monkey Bread. It looks delicious. My youngest son has expressed interest in cooking as of lately and we have both enjoyed hanging out in the kitchen together. This is a great recipe for someone his age, he would need very little guidance. As a bonus everyone in the house would love eating it! Wow what a beautiful dessert! Yum! Thanks for linking up to Merry Monday! Pinned Yummed & Sharing on FB! Have a great week! I’m loving all of these monkey bread recipes coming to light. This white raspberry one is one of my favorites so far! Thanks for linking up with Delicious Dishes Recipe Party! This looks so delicious! Gotta try it! I thought I loved normal monkey bread before but you have blown my mind with this! So yummy! 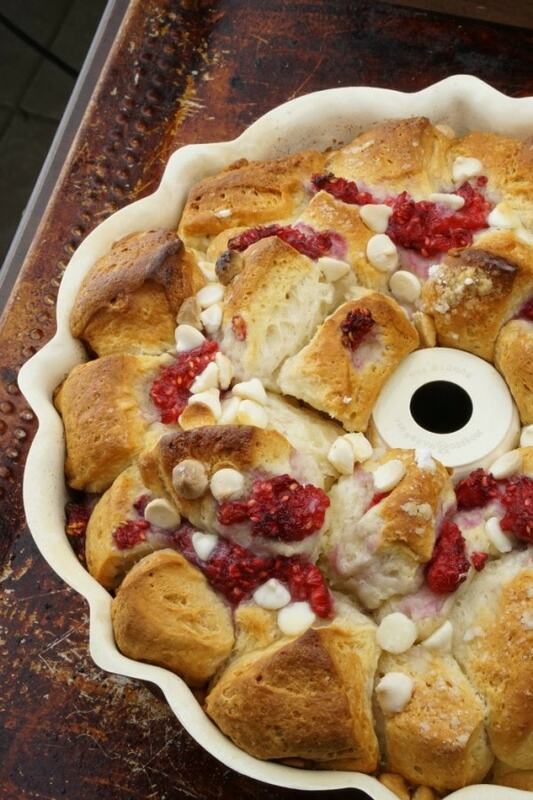 A world of possibilities when you look at monkey bread this way! Thanks for linking up with Delicious Dishes Recipe Party! 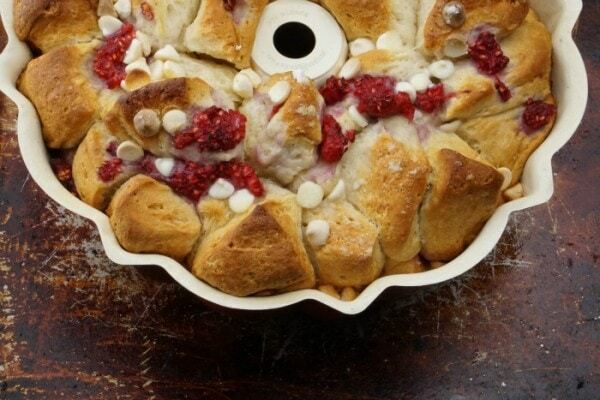 This is the most amazing monkey bread ever! This monkey bread looks amazing. I have never made it before but would love to make this.